A smashing entry into the elite of the best players in Barcelona, ​​The Brothers Dechamps (Hargnies) Just enter their name in gold letters! The Brothers Dechamps (Hargnies) Just enter their name in gold letters! 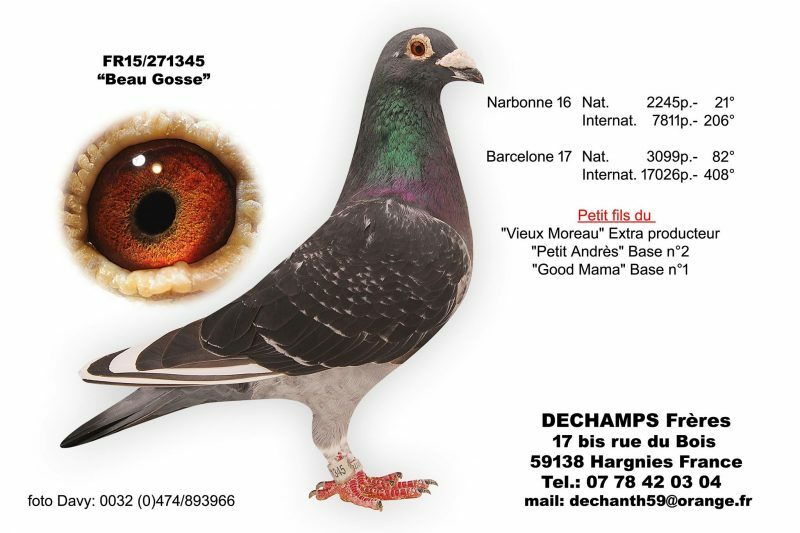 The mere mention of this word is synonymous with magic in the field of pigeon racing. This is the main stage of the calendar where any long-distance enthusiast dreams of distinguishing himself one day. This long and beautiful history has been built over the years with the exploits accomplished by pigeons out of the ordinary, but also amateurs of the same ilk who have written in letters of gold their name in the great book of the international pigeon fancier. The impossible feat, the one that will never be equal, is the prerogative of an amateur of Ottignies, in Brabant Wallon. In the 1962 and 1963 editions, he won the international competition with the same yacht. Adelin Desmarets and his “Pale” thus entered the legend. In 1987, it was Chrétien Vanoppen who won what is still considered the hardest edition and where only one sailboat, the winner, managed to cross the fateful 800-meter flight. minute. If we stick to the winner of this edition and if this memory is very tenacious, it is also and above all according to the extraordinary reproductive quality of one of his brothers born the year following that of the coronation in lands Catalan. The “Blauwe Vanoppen” has thus allowed the great rise of the Wijnands colony and the blood of this exceptional sire still flows in the veins of many stars of our time, followers of the long distance. Barcelona is also the inevitable association with the name of André Vanbruaene who won the stage twice and whose origin is world famous. Regularly, as was the case with Luc Wiels, Vanbruaene pigeons come at the top of the event result, especially when the flight conditions are demanding. How also to forget the “048” Robert Ben who won the podium full on the French ranking and propelled his owner on the front of the stage? And it is in this same context that it is necessary to rank the incredible, the improbable, the fantastic exploit realized in this year 2017 by the Dechamps brothers. And this is not a particular subject of the loft that should be honored, but the entire team of travelers distinguished themselves on the main stage of the calendar. What the Dechamps have just accomplished is prodigious, it is the most beautiful ensemble performance ever made in Barcelona. And this, of course, includes the context in which this extraordinary step took place. Probably blocked by a disturbance much too active for the pigeons to cross and a release much too late, the birds were indeed forced to fend for themselves to escape the real trap that had been stretched to them. The first pigeons did not finally fall until midday on Saturday and the evening between 3 and 4% of the contingent was back in the fold. In some dovecotes, the empty places were legion, others even, and not least, had not yet seen the least feather. And in Hargnies? A real festival! Seventeen of the twenty-five hired their female on the evening of the second day of flight. Nearly 70% of the incumbents were at the station while the desolation lived many spirits. Do not be afraid of words and have the honesty to recognize this feat and qualify it to its true value. 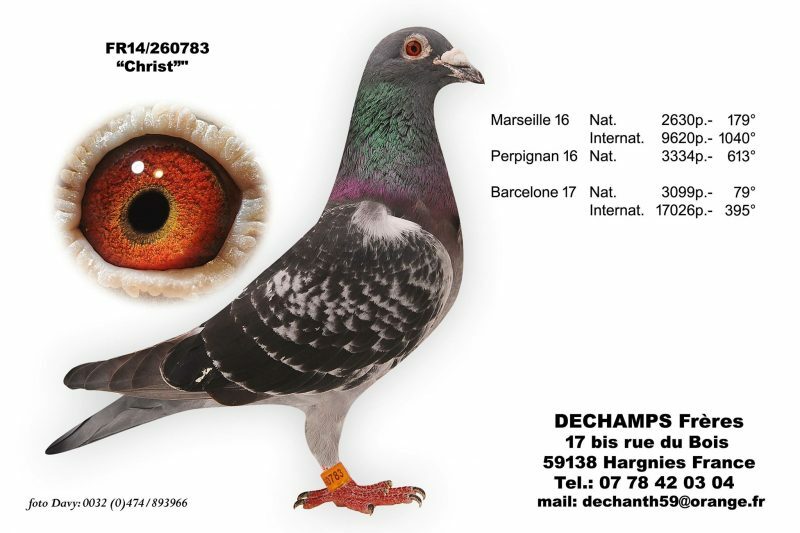 The Dechamps have just put their name in gold letters on the list of this prodigious stage and can, without blushing, place this feat in the gallery of the greatest feats of arms of the most terrible event of the pigeon calendar. Anthony has always been attracted to pigeons. 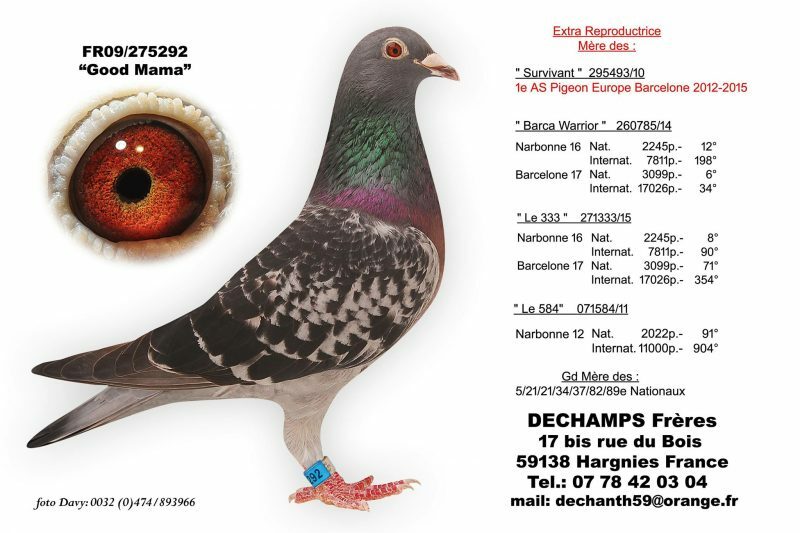 From an early age, he took his brother, Mickaël, three years older, to the back of the farm of grandparents where dragged pigeons permanently dragged. Local pigeon fanciers were quick to spot the carousel. Thus J.P. and Lulu Dubreucq helped them build a small dovecote made of odds and ends. A good vitessier, J. Mortaigne, offered to the brothers the first birds to begin. They played for two years in Hargnies before convincing their parents to allow them to build a loft at Maubeuge’s family home. Speed and middle distance were then the contests targeted until the early 2000s, when Mickaël began cleaning, returning to live Hargnies at a stone’s throw from the farm grandparents. Anthony continued to play alone and lengthened a little distance, thus taking a first contact with Eric Vitel who became for him a model, almost a brother as he likes to emphasize. In 2009, it was Anthony’s turn to move to Hargnies to join the bulk of the Dechamps clan who was already there. Family spirit is not an empty word here, and you should never go far enough to be together in this way. His home, he will have it built on land adjacent to the farm grandparents, a return to the sources in a way. Naturally, the brothers decided to resume the competition together with one goal: to make Barcelona the favorite contest. Le «14 Carats» de chez Eric Vitel. Le «Petit Andrès», petit-fils du «Wim» de chez Vitel. La femelle acquise à la vente van der Velden. 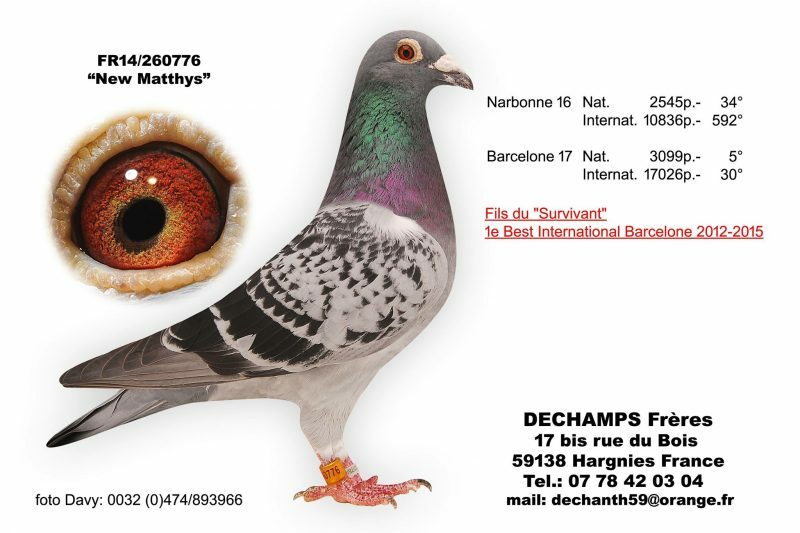 On race, two pigeons came out immediately, the “Survivor” and the “Matthys”. 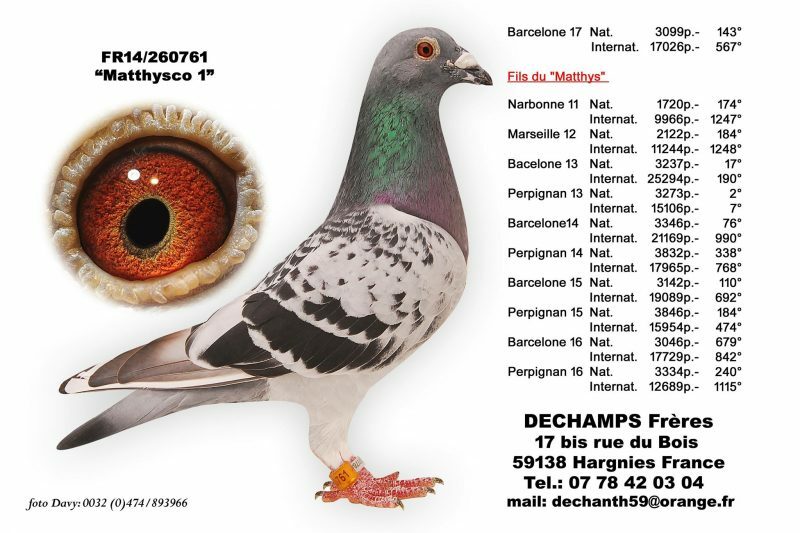 “Matthys”, a product 75% Janssen and 25% Vitel, became the 4th best European pigeon on Perpignan on the rankings added three years and the 7th European over Barcelona over four years. 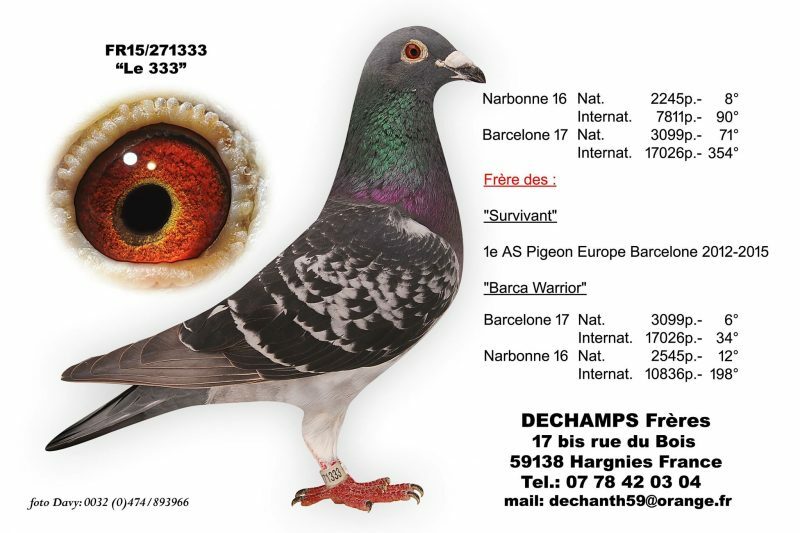 The “Survivant” son of “14 Carats” and a daughter of “Petit Andrès” X van der Velden will be the first European Ace pigeon over 4 years in Barcelona. Better yet, he is already the father of the 38th International Barcelona 2017. 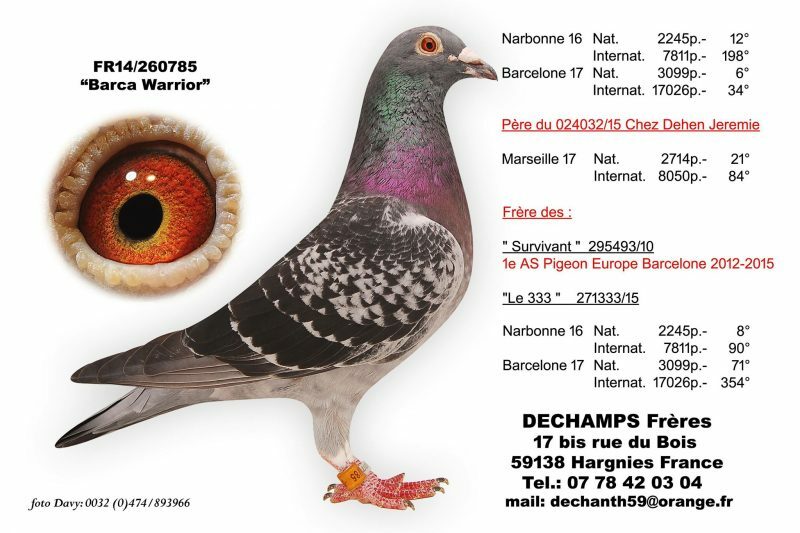 Two half-brothers to the “Survivant” are 39th and 115th international Barcelona in the same year 2017. 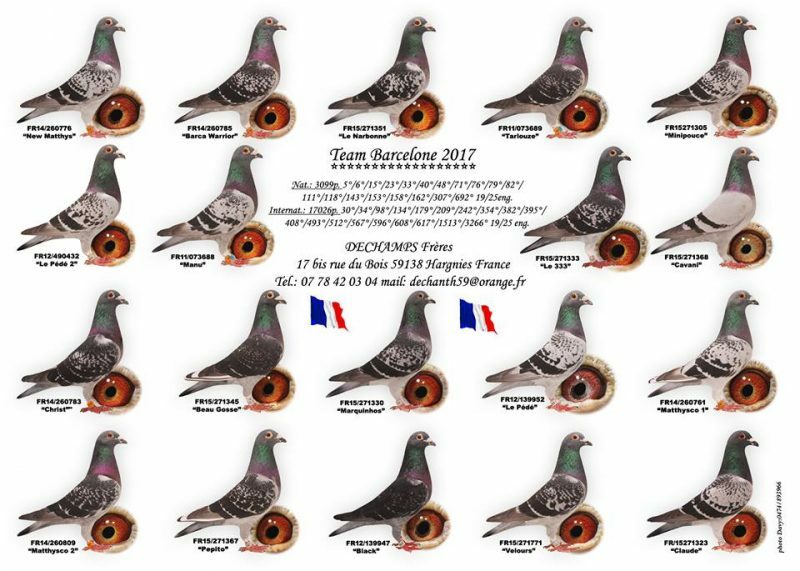 The starting line was also modified according to the results obtained and the skills emerging from the pigeons participating in the Catalan stage. So it was decided to send the yearlings to Narbonne and this while knowing that they are just trained by the care of the amateur the year of birth. 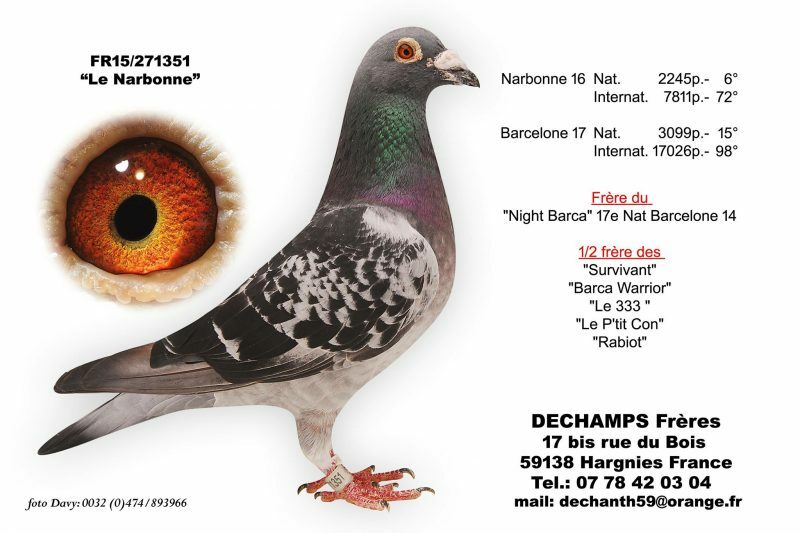 Very quickly came the conclusion that the best on Narbonne were the ones performing later on Barcelona. The train and the rails, a real breeding policy was released and a conduct in competition, the Dechamps brothers set out on their way to their ultimate goal. Two races highlight the strength of the sailboats built by the Dechamps brothers. The Barcelona competition in 2013, an arduous year for sailboats and Barcelona in particular. 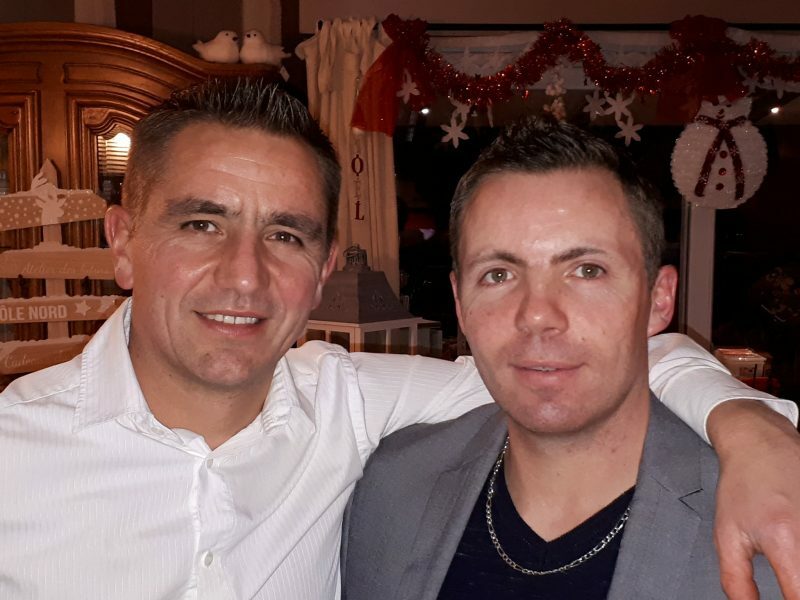 A first entry in the international top 100 of the event was then recorded and very quickly confirmed by two tops 100, still at the international level, on the stage of Perpignan. 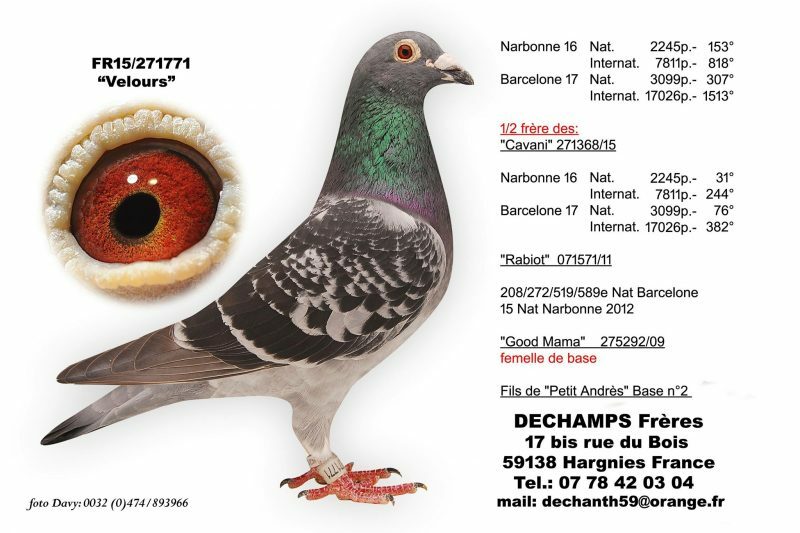 The other clue is closer and comes from Narbonne for the yearlings last year and the real festival of the young guard. 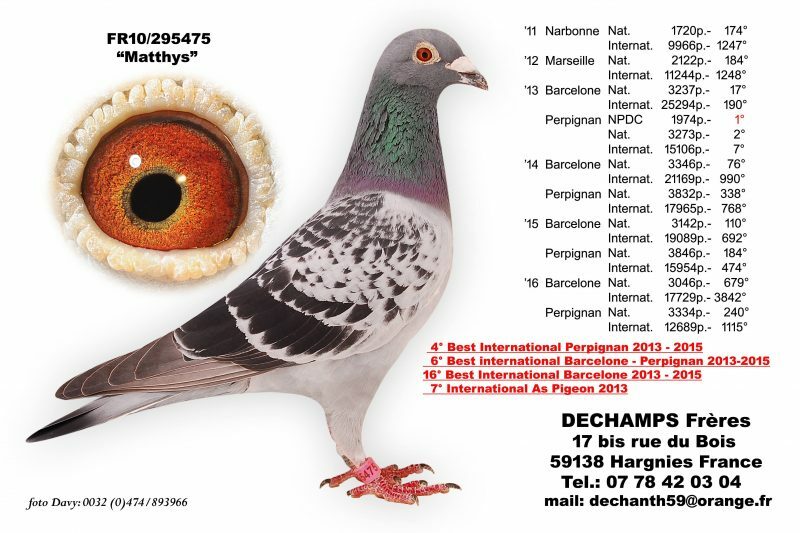 With 11 pigeons entering the top 100 French national, including two repeating the feat at the international level. Very talented pigeons when conditions are particularly complicated, behaving well in case of bad weather or favorable wind, everything was in place and in place even among the Dechamps. 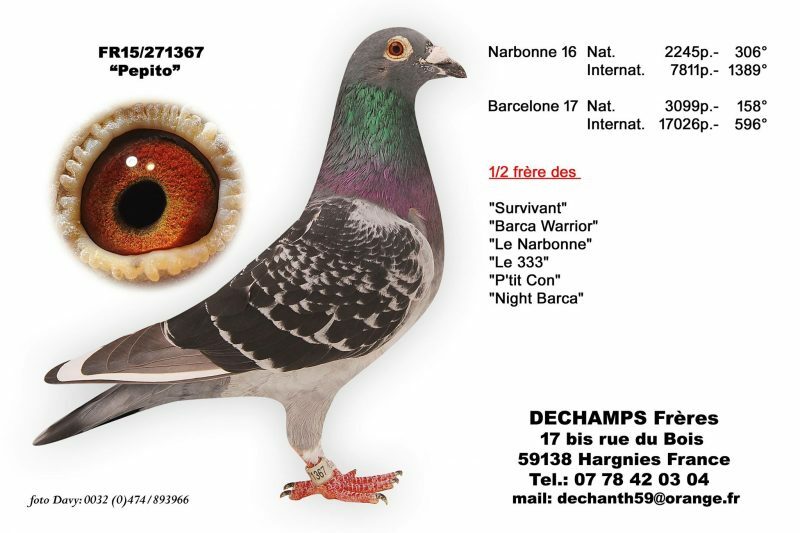 In the winter of 2016/17, family difficulties had come to an end and the Dechamps brothers had decided, before the start of the season, to put an end to the pigeon game so that Anthony could take care of his two boys at leisure. Before bowing out, however, everything would be done to make 2017 the fireworks that could be expected from the previous results. Thus, to focus solely on Barcelona, yearlings were sold early in the season. The only idea was to shine with the sailboats during the first weekend of July. The widowers were mated the third week of February and had the opportunity to finish rearing one young per nest. Only one personal training was on the program, with a range of about twenty kilometers. After two consecutive speed races, three stages of middle distance successively came from 375, 520 and 545 to finish, a fortnight before Barcelona basketing. If at the end of the 2016 season the whole team had received a Baytril cure for five days in order to get rid of the trash dragging in the baskets, nothing was given to them before the last training flight. The pigeons were kept an eye on the return and their attitude indicated that everything was going well. A cure against trichomonas and another to ensure that everything was in order in the airways were started. The birds thus left in an extraordinary state for their ultimate test. A word about the food that is based on the super diet of Mariman, which is replaced by the sport of Versele in the last days before the baskets. The cleanliness of the facilities? This is not too much the case here in Hargnies. The dovecotes are oriented towards the North and are very dry when the sun is sufficiently present. This was the case in 2017. Cassettes and soil had been left as they were for more than a month. Hardiness is at this price in Hargnies. The reasons for success ? There is not one in fact! The formidable feat achieved by the Dechamps and which will probably not be exceeded soon is due to the coordination of several elements marrying well to strive for success. First of all, the choice to participate in the only event in Barcelona allows to mobilize for this one goal by sparing the colony the inconvenience associated with other events. 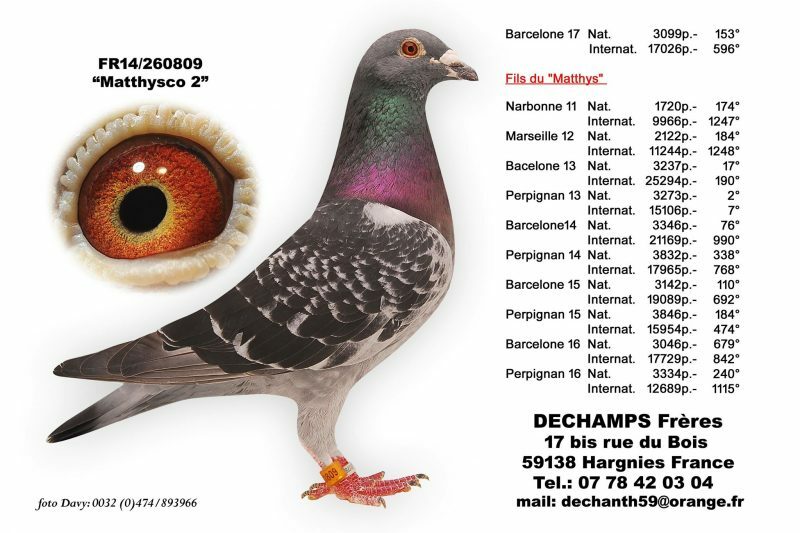 It is one and the same push of form which is thus on the program and it is not necessary that the pigeons are at the top of their capacities during the preparatory stages. The cure, the only cure in the program, also comes to play a preponderant role, much more important than if the reminders are legion. Carefully chosen origins and a well-thought-out breeding policy are also important assets. Finally, the preparation for the most difficult events is undoubtedly what allowed this performance at the highest level. 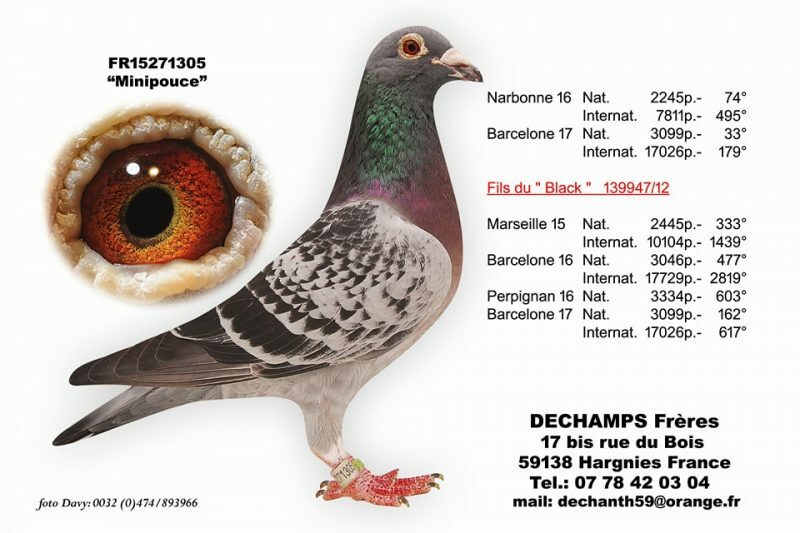 The Barcelona contest in 2013 and the Narbonne stage, especially in 2016, for the yearlings are all indicative signs that foreshadowed this explosion expected by many. It is a pity for the pigeon sport that such champions are forced to leave the stage in full glory. He would have been curious to see the development of such a power, such a strike force. However, this is only part of the discount because the brothers Dechamps are determined not to stop there and come back to prove to us that the chance did not really take place in the accomplishment of such a successful service. Fourteen of the “survivors” of this terrible Barcelona in Hargnies are only two and three years old. The future would probably have given us the most beautiful razzia of all time on the rankings Interparès. It is also to this that we recognize the value of a colony, in the quality it brings to where it is introduced. 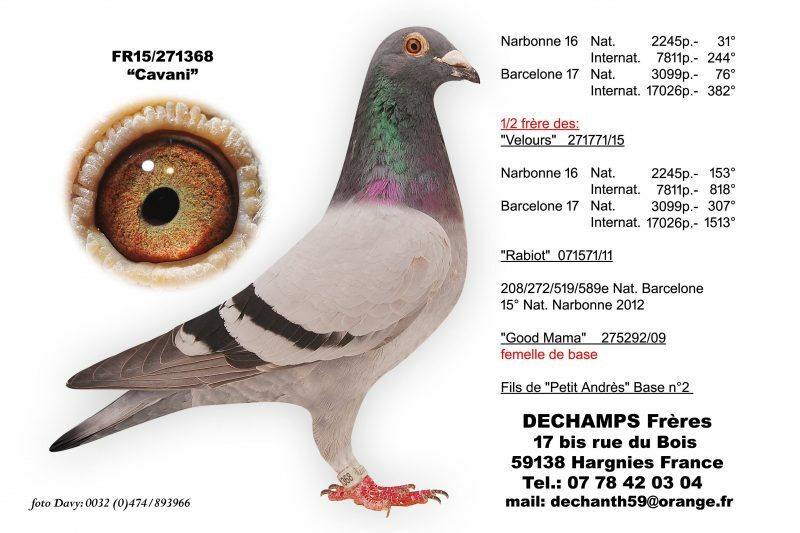 In a very short time, the pigeon made by the Dechamps brothers has already proved that it has a sacred answer. 10/11244 Marseille 2012 in Emmanuel Michiels loft. 31/25294 Barcelone 2013 in Emmanuel Michiels loft. 38/9620 Marseille 16 in Emmanuel Michiels loft. 79/8050 Marseille 2017 in André Minet loft. 84/8050 Marseille 2017 in Jérémy Dehen loft. 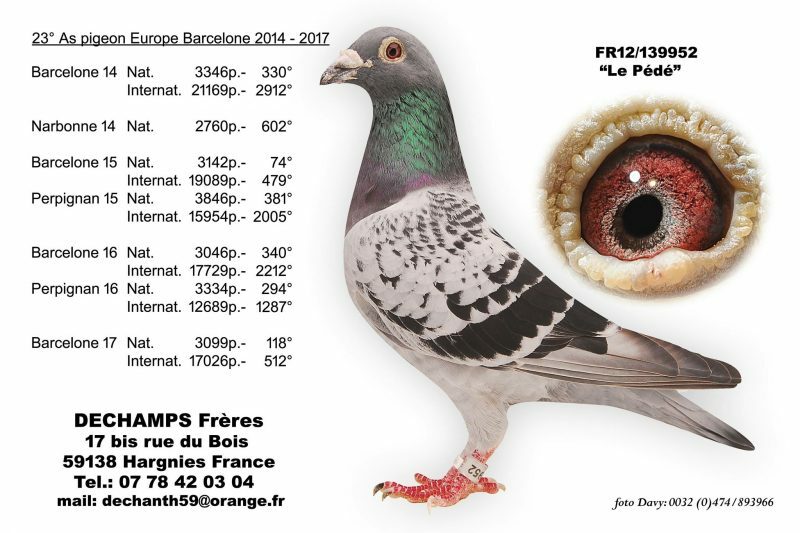 89/14851 Perpignan 2017 in José Poteaux loft. On the international race in Narbonne, in 2017, there are no less than 6 pigeons in the top 100 national and coming from the brothers Dechamps, played in other dovecotes. National 3.099 older: 5, 6, 15, 23, 33, 40, 48, 71, 76, 79, 82, 111, 118, 143, 153, 158, 162, 307, 692 and 19 prizes of 25 basketed. International 17.026 older: 30, 34, 98, 134, 179, 209, 242, 354, 382, 395, 408, 493, 512, 567, 596, 608, 617 and 19 prizes of 25 basketed.